Okay friends, well, if you haven’t guessed by now, I’m kind of a big fan of making lentil soup in the Instant Pot. It’s just so easy and cozy and easy and hearty and did I mention easy? Right, right, that I did. 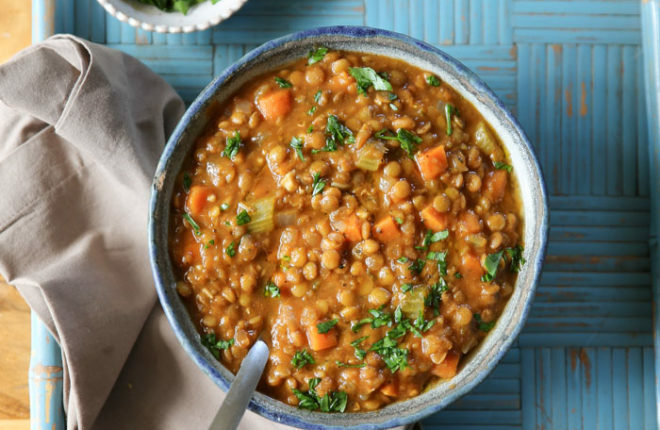 This Instant Pot Lentil Soup is a riff on my Simple Lentil Vegetable Soup that I make on the stovetop which is a riff on the Ina Garten version (does that goddess ever do things wrong? Rhetorical question) which is a riff on I have no idea, I just wanted to say “riff” one more time. But anyway, now that I’m all about lentil soup Instant Pot style, I thought I’d go this direction. 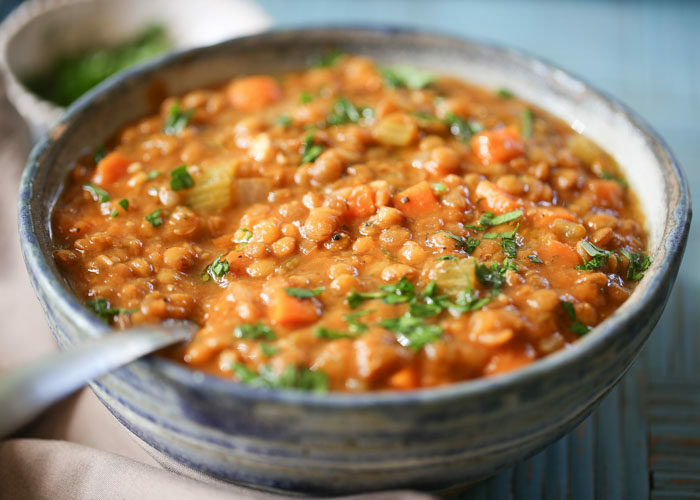 A simple Instant Pot lentil soup with onions, carrots, and celery; green lentils; ground cumin and thyme; tomato paste and a dash of red wine vinegar for oomph. I love all the flavor in this one; my guy (the carnivore) loves it too. Even though it’s vegan. I’m not trying to convert him or anything, but I kinda love it when that happens. But back to this cozy (easy) stuff! Bring on the crusty bread, baby! I’m goin’ in. You should too! 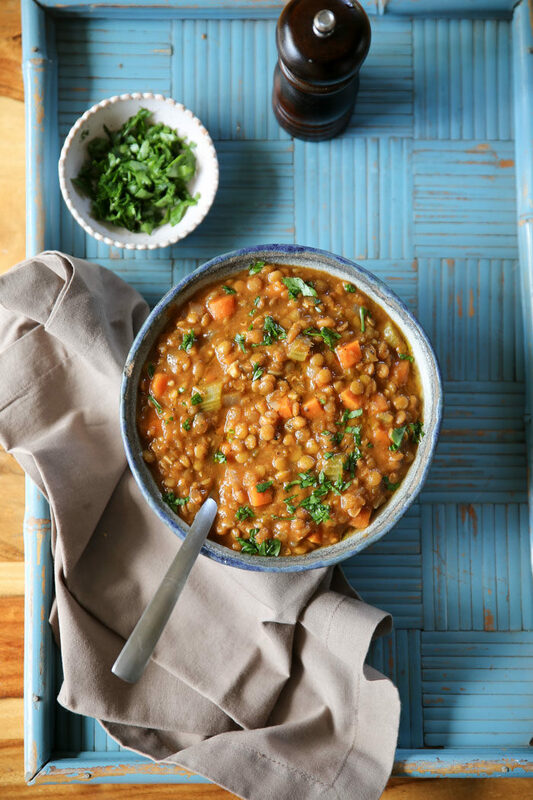 Instant Pot Vegan Golden Lentil & Spinach Soup – French green lentils with with turmeric, ginger, cumin, thyme, and a hefty handful of spinach. 5-star rated and one of the all-time most popular recipes on Kitchen Treaty! 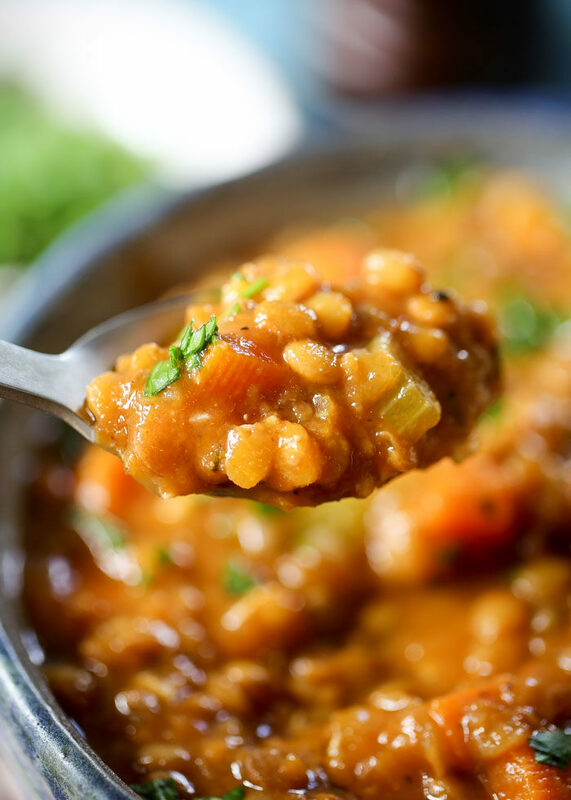 Instant Pot Curried Carrot Red Lentil Soup – Split red lentils, carrots, ginger, and curry. This one’s super fast – and full of flavor. And next week, I’m going to be sharing my secret to getting a leg up on lentil soup: Instant Pot Lentil Soup Starter Packs. Intrigued? I mean, what about lentil soup is NOT exciting, am I right?! (But seriously, do come back next week to check it out because I promise, this little meal-prep hack makes weekday dinner soooo much nicer). Set Instant Pot to saute. Add olive oil. When warm, add onion, carrots, and celery. Cook, stirring occasionally, until softened, about 8 minutes. Add the garlic, thyme, cumin, 1 teaspoon salt, and 1/4 teaspoon pepper. Cook, stirring, for one more minute. Add the vegetable broth, lentils, tomato paste, and bay leaf. Stir to combine. Place lid on Instant Pot and make sure the release valve is in the “sealing” position. Press the “Manual” button (or “Pressure Cook” button on newer models) and set the timer for 30 minutes. When the venting is complete, remove the lid of the Instant Pot. Remove the bay leaf. Stir in the vinegar. Taste and add more salt and pepper if desired. Serve topped with minced parsley and a drizzle of good extra-virgin olive oil if desired. An extra turn of freshly ground pepper doesn’t hurt either! * If you want to use a different kind of lentils, I’d estimate you’ll want to subtract 5 minutes for French green lentils or brown lentils. 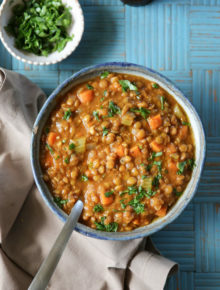 I’d steer clear of split red lentils because they tend to dissolve and personally, I would miss the texture. Meanwhile, I’ll try it myself and will come back update these notes with exact cooking times once I’ve tried it! Love your composition of ingredients. Thank you very much ! If i have 3 Qt insta pot how do I edit this recipe? Made this last night and it turned out delicious. I served it over basmati rice. Perfect.